Because of its unique shape, the JS Motorsport Beehive Spring and Retainer kit is much lighter and more efficient than other stock or racing springs & retainers. The small diameter and tapered section near the top helps tune out unwanted resonance, and eliminates the need for an inner spring while at the same time allowing for a smaller, lighter weight Titanium retainer. Energy saved at the valve train goes to the rear wheel. They come with either thin or thick spring bottom washers. 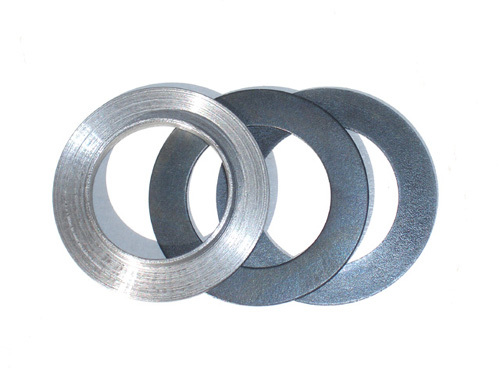 The thin street bottom washers are for matching stock street spring tension. 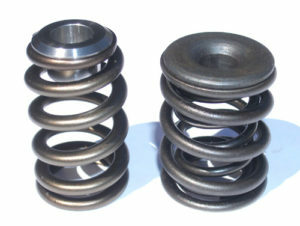 The thicker racing spring bottom washers are for racing and give you the same spring tension as dual springs but weigh only 1/2 as much – a win/win situation for street or racing – good insurance against unwanted valve/spring bounce and the horror of dropping a valve into your combustion chamber. 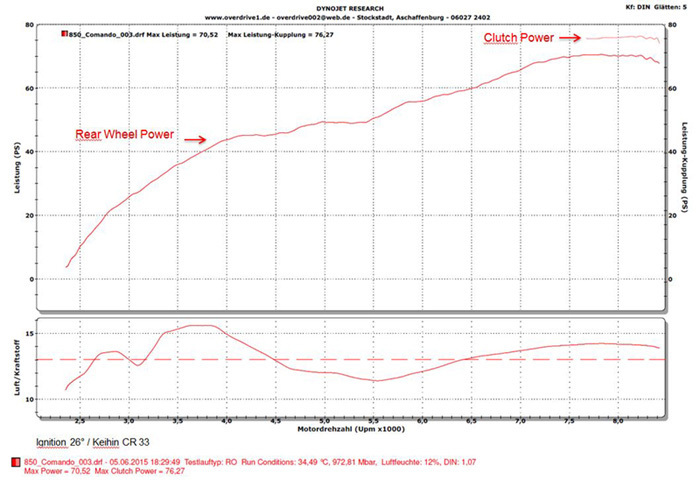 I have personally tested these components to 8200+RPM without a hint of valve float. 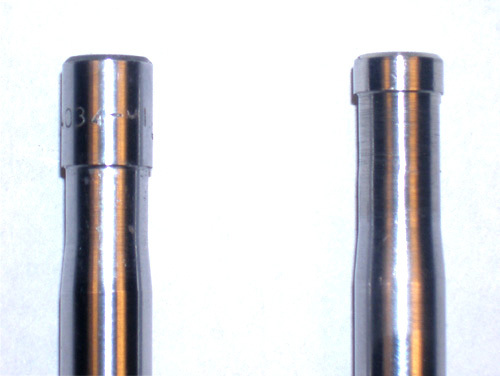 The valve tip in the photo above right is supplied with a higher cut in order to provide the correct spring pressure rate and avoid coil binding. You cannot use stock valve tips with these longer springs. Note that longer JS beehive springs have an advantage over shorter conical springs because a longer spring has a more linear spring rate and that means less peak pressure and less wear on the cam. Instructions are included and explain how to set up spring tension for either racing or street use. Our black diamond valves come with stellite tips and do not need lash caps. See spring cup and adjustment shims in photo below. Use your original split collets. A JS Motorsport Beehive Spring Kit installed with the provided bottom spring washer for street use will have the same spring tension as stock springs that are ideally shimmed to .060″ from coil bind with a stock performance type cam. In this configuration the beehive spring will have an installed height of 1.450″. Note that the extra coil bind clearance allows the Beehive Springs to be used on the street at stock tension with street type bottom washers. Or they can be used on the track with thicker racing type bottom washers and increased tension as described above. Note that I also offer a slightly thicker stronger #2 racing beehive spring for extreme RPM shortstroke racing only (not for street). These are special order and you must ask for them but they are the same price. If you just want to buy the springs and modify your existing valves to fit (see diagram). A JS Motorsport Beehive Spring Kit installed with a racing cam of .400″ lobe lift and shimmed to .060″ from coil bind will have about 5lbs more tension at peak pressure than other racing springs (RD brand shimmed to .060″ from coil bind). In this configuration the Beehive Spring will have an installed height of approx 1.350″ (compare weights and springs). 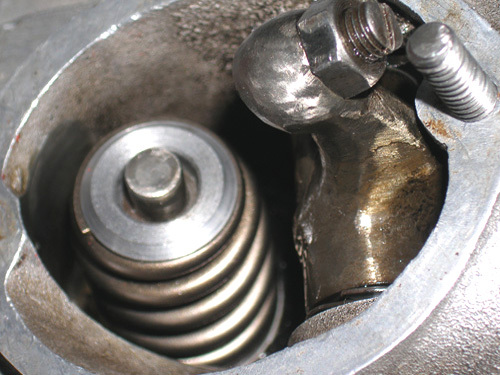 Note that heavy dual springs are a primary cause of “valve bounce” because the inertia of a heavy spring causes it to keep springing up and down even after the valve has slammed against its seat. See valve bounce video. Hi Jim. They looked so small but despite having a little bit too long installed height of 1.40″ there were no problems reving the engine to 7000 rpm. This with a 7S camshaft and without any valve float. Quite impressive I must say. I was closer to the tridents this weekend than ever before. Best regards Per H.